Outsight has provided innovative lighting solutions for the film and TV industry since arriving on the scene in 2005. Illuminating visually-stunning films like Rogue One: A Star Wars Story, Ghost in the Shell, Mad Max: Fury Road, The Hobbit trilogy, and Thor: Ragnarok, Outsight’s pioneering technology is setting an industry standard for lighting professionals worldwide. That’s why we were so excited to get our hands on the company’s new Creamsource+ LED lighting tools and take them for a test drive for our readers. 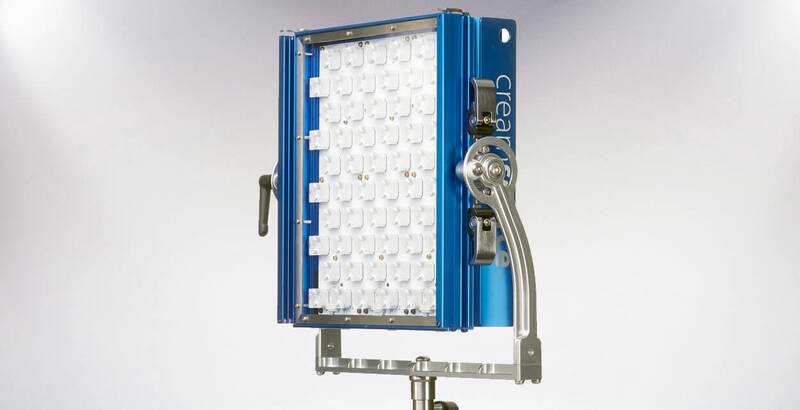 First launched at NAB 2016, Outsight’s Creamsource+ range features a fourth-generation LED light engine with a 90+ CRI/TLCI and is available in Daylight (5600K) or Bi-Color (2700-6500K) flavors. We tested out the two size options currently on the market: the Doppio+ and the Mini+. The gear arrived in durable, padded cases that were very convenient and surprisingly easy to carry. We assembled the kit in an indoor studio setting and were immediately impressed by the sleek, well-crafted appearance of the units. They’re built to be sturdy while maintaining a compact form factor. The package included softboxes, barn doors, and snapbag grids for each unit. We were impressed with the kit’s easy setup and the range of included accessories. The Doppio+ is a large flat panel array measuring 30” x 18” x 4” and weighing in at 20.7 lbs. The Mini+ offers the same features as the Doppio+ in a compact 1×1 form factor, measuring 14.7” x 15.4” x 4” and weighing just 11.4 lbs. Both units feature intuitive, easy to use interfaces with high-precision digital rotary encoders, four-button keypads, and graphic LCD displays. The units can also be controlled with a 5-pin DMX or a wired remote control. Both units offer impressive 0-100% continuous dimming capabilities and are optimized for high speed photography. They are completely flicker free, even at frame rates of over 1000fps, and can be easily synchronized with a camera’s shutter. The units feature a 100% silent cooling system under normal operating conditions, and are equipped with a low-noise back-up fan for more extreme conditions. 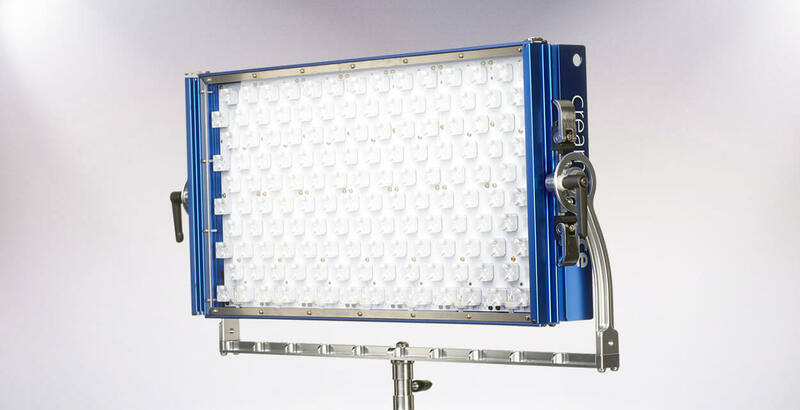 The most impressive aspect of the Creamsource+ range is the quality of the light output. The units’ precision optics deliver a consistent beam with naturally soft edges that wrap around your subjects. The powerful LED engine provides strong intensity and throw that is easily customized with the kit’s wide variety of shaping tools. 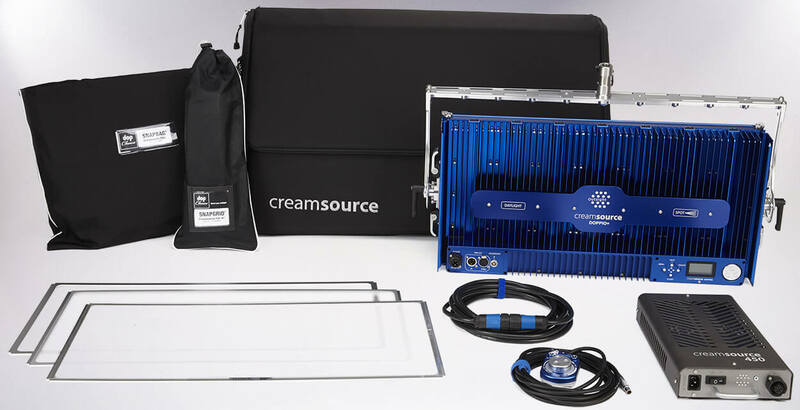 All Creamsource+ units include a standard yoke for stand mounting, an AC power supply, a power header cable, a medium diffusion lens, a gel frame, and a region-specific power cable. The Pro Kit includes a softbox and carry bag, and the Gaffer Kit adds a remote and snapbag grid to the Pro package.